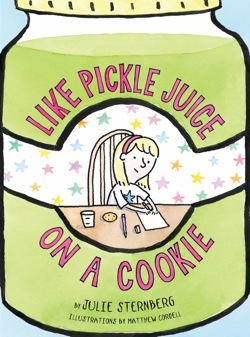 I had heard wonderful things about Julie Sternberg’s book Like Pickle Juice on a Cookie and, let’s face it, any book with the word “pickle” in the title has got to be good. So I made a bee-line for the Storyteller bookstore in Lafayette. Like many other books I’ve loved, I was initially drawn to the cover art (by Matthew Cordell) – with its simple illustration of a little girl writing a letter. What I could never have imagined is how utterly sweet and touching the book inside would be. Sternberg has created, in this 128 page book, an unforgettable character in Eleanor as she suffers through the loss of her beloved babysitter Bibi. When Bibi moves to Florida to be with her father, Eleanor struggles through various stages of grief and ultimately learns to accept and love her new babysitter who will never truly replace Bibi, but just might be able to forge new pathways of friendship with this darling little girl. Written in a simple, almost poetic way, Like Pickle Juice on a Cookie speaks beautifully to the emotions of a child who has suffered a loss and will certainly serve that magical literary purpose that books so rarely do: making a child feel better and smile through tears. 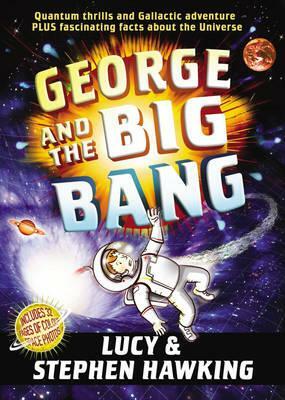 Never before have the mysteries of the Universe seemed so appealing than after reading Stephen and Lucy Hawking’s latest book, George and the Big Bang. Beautifully and engagingly written, this newest offering in the series is an exciting adventure that strikes all the rights chords for young readers. It’s jam-packed with fun, heart-racing capers, villains, a lonely pig and, believe it or not, lessons from the world’s most famous physicist. If you’ve ever read Stephen Hawking’s theoretical work, you’ll know how difficult it can be, at times, to wrap your head around. What’s utterly brilliant about this series is that Stephen, in partnership with his delightful daugher, Lucy, has taken his most highfalutin concepts and broken them down into understandable and downright appealing ways. As a university freshman, A Brief History of Time was required reading for all incoming students. Thus, I spent my summer slogging through his dense prose and, at times, mind-boggling theories. For a literary soul with nary a minute of experience with physics, his book was like reading an Ancient Sanskrit text without the aid of a translation. I recognized the brilliance, respected the man behind the ideas, but couldn’t quite decode the complexities of his imagination. With this children’s book series by Hawking and his daughter, it’s as if I’ve been given a second chance at understanding the Universe. In this particular book, George and his best friend, Annie, (isn’t it wonderful to see boy/girl friendships in children’s books?) are back at their intergalactic adventures courtesy of a super computer named Cosmos. Using portals offered by Cosmos, George and Annie begin this tale in a rather unexpected way: trying to find a new home for George’s pet pig. What ensues is a conspiracy of the most clandestine and sinister kind that involves Annie’s brilliant father, Eric, and his experiment to find the source of the Universe. Children will love the fast-pace, the space and time travel and will most likely be asking for a Cosmos of their own for their next birthday. Eager parents will appreciate the fact that interspersed throughout the book are lessons and illustrations about physics – offering a fun and surprising way for kids to take the first step towards understanding Stephen Hawking’s brilliant mind. Over the holiday break, I made a point of reading a few books (children’s and otherwise) that have long been on my to-do list. These included You Know When the Men are Gone (Siobhan Fallon’s utterly remarkable and heartbreaking collection of short stories centered around the military wives of Fort Hood) and Mrs. Dalloway (which I read every year just to be inspired). Also on that list was R.J. Palacio’s debut novel for young adults, Wonder. I’d seen this book on a number of “Best of 2012” lists for both children and adults and am always impressed when a writer can span the two audiences. Kathryn Erskine’s mockingbird is another of these books that speaks to any age – a brilliant, lovely piece which I hope to review soon. Wonder tells the story of young August Pullman, a ten-year old boy born with a severe facial deformity. Homeschooled until this story takes place, Auggie has been protected by his lovable parents and sister with a fierceness and loyalty that any parent would exhibit in such a situation. Now, in an attempt to bring him out into the world and mainstream his education (both academically and socially), Auggie will take on new challenges as a 5th grader at an elite private school in his neighborhood. What unfolds is a story so universal in its pain and joy that every child and adult can relate. Auggie’s challenges, his ups and downs are, indeed, magnified by the extreme physicality of his differentiation, but the heart with which Palacio tells his story, makes Auggie an everyman…everyboy. Friends come and go, cafeteria seats are saved, then not saved, then pulled out from under him, until ultimately, kindness wins. This is an important book. One that every child and parent should read, even together as a means of opening up necessary discussions about interaction with one another. And in an era of bullying and teasing and taunting the likes of which we have not seen before, Auggie’s story is not only a beautiful example of the resilience of the human spirit, it is a reminder that there is always kindness in the world. It may take a while a find it, but it’s there, waiting with wonder. Today, in place of recommending a holiday book, I wanted to take a minute to thank one of the most gracious, talented and altogether wonderful children’s book authors around. Jarrett J. Krosoczka, author of the inimitable Lunch Lady series among other amazing works, recently unveiled a piece of artwork in response to the tragedy in Connecticut. This piece, entitled “Make Magic, Preserve Wonder” is, to me, a true recognition of all that is most wonderful about children and all we must to do safeguard just that. This piece, which you can see above, was created by Jarrett to honor the beauty of childhood and the role that educators play in maintaining that beauty for the world. So today, in honor of Jarrett’s contributions, please take your child to a local library or bookstore and pick up one of his many, amazing books. From Lunch Lady and the Cyborg Substitute (my sons’ personal favorite) to Baghead to Max for President, Jarrett makes magic and preserves wonder with every word he writes and each picture he draws. First, a brief disclaimer. This is not a “holiday” book, per se. No tinsel or holly or jolly gentleman. But it is just one of those amazingly charming books with snow in it, so I’m willing to include it in my holiday books round-up. I hope you’ll forgive me. It’s just too adorable to pass up. And penguins are festive! They’re jolly, right? 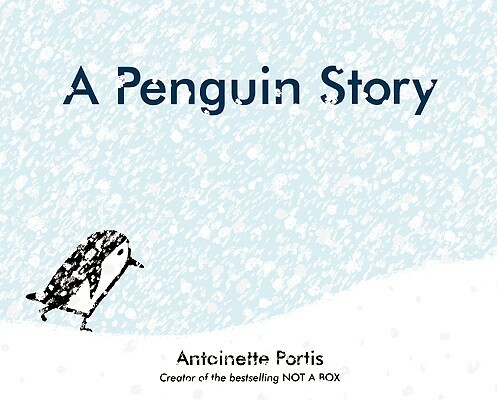 For anyone who loved Antoinette Portis’ “Not a Box” and “Not a Stick” (trust me…you’ll LOVE them), her tale of a penguin named Edna cannot be missed. First of all, kudos to any author who names a penguin Edna. Sheer perfection. In Portis’ tale, Edna wants more from her life than just the white snow and the occasional waddle. What she finds is a research station and an orange glove. Sounds simple? It is….simply wonderful. Portis’ poetic and minimalistic text, dry sense of humor and graphic novel-like illustrations make this book a favorite of mine and one I heartily recommend to you this holiday season and every day after it. Raymond Briggs’ The Snowman was a staple in my home growing up. Not only did I linger over his stunning illustrations, but my mother would always play the soundtrack of the book for me on our little tape player. What distinguishes Briggs’ tale from other holiday books is the fact that he so compellingly and beautifully weaves the story of the little boy and the snowman without words. Told only in pictures, The Snowman is as clever and engaging a read as any word-ridden book and will delight readers young and old. In the book, a little boy builds a snowman. Then, that night, after a fitful sleep, the boy goes outside to find that his snowman has come to life. But this is no Hallmark card remake of Frosty the Snowman. This is better. It is lovely and heartbreaking and, without one word, entirely literary. If you’ve never read this book, please look for it at your local library or bookstore. It is one of the most wonderful books in the world. So, you want to give the all-time classic Christmas tale to someone this Christmas. Well, it’s certainly easy to become overwhelmed by the sheer number of them on the market. Personally, I don’t think anyone can have too many copies of Clement Moore’s ‘Twas the Night Before Christmas. (I, myself, have about six and each one is a favorite.) But, in my opinion, if you are searching for the most beautiful of them all, look no further than Mary Engelbreit’s version. The quintessential colored pencil artist, Engelbreit has created the most gorgeous Christmas Eve tale yet – and her illustrations are the perfect match for Moore’s timeless verse. This books makes for not only a wonderful Christmas Eve read-aloud tradition, but would make a gorgeous gift to anyone you love. It’s a big, beautiful book filled with timeless delights and inimitable illustrations. A true Christmas treasure.